One of the challenges of doing work in two regions is that I’m constantly torn between where and how to spend my time. It’s not just about how much time; it’s also about the quality of the time and the nature of the work done and the people I do it with. Well, last year I had some extraordinarily productive weeks in Busoga, the eastern region of Uganda. I wasn’t there for that long, and at the time things seemed to move slowly. However, I got some of the most intriguing footage, the most informative interviews, and most importantly, some great opportunities to step outside Buganda in order to better understand what I was seeing. Therein lies one of my best reasons for continuing to work in two regions: I gain valuable perspective from seeing cultural and ritual similarities and differences. I had been anticipating this return to Busoga for some time. I had important follow-up questions after reflection on the materials from last year’s trip. I also really wanted to see my friends. Sadly, my first visit was already overshadowed with bad news. 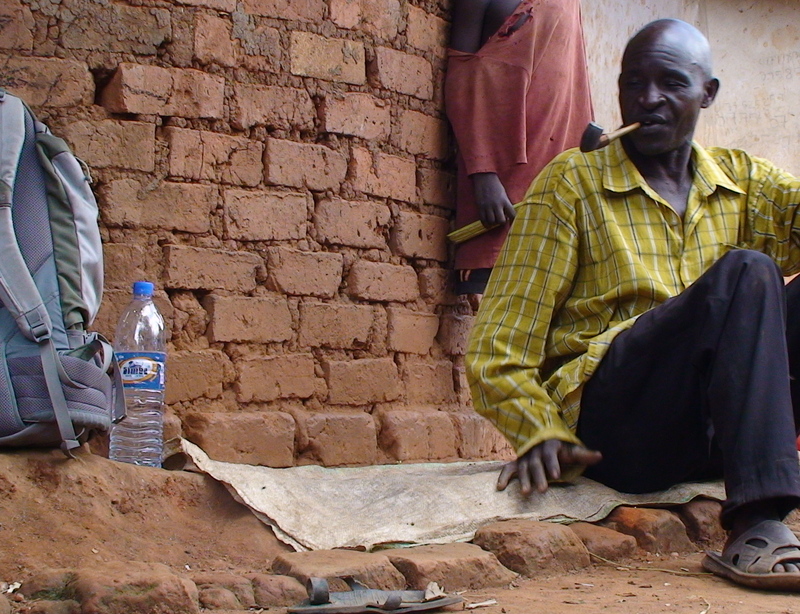 A dear friend, the first muswezi healer I met in Busoga, had lost his wife several months ago. When I got to his place, he added that he hasn’t been able to work outside his compound much lately because his legs have been bothering him (presumably arthritis–he’s 85). Nevertheless, Kabindi greeted me warmly and was happy to talk follow-up to the rituals he took me to last year. Following our reunion, Kabindi asked me a favor. He had left a bag behind at the compound of a drum-maker whom we visited last year. Although he’d acquired a car in the last year, he hadn’t been able to make it over there, or use it much at all for that matter, because of his legs. I couldn’t have been happier to have some way to help him after nearly four years of really instructive interactions with him. I brought the bag back and even got to replace a damaged piece from my drum collection while I was at it! My next trip took me to another group of friends in Nawandyo who really took me places last year. Kyambu and his family showed me amazing hospitality, complete with milk tea fresh from the cow, and weeks of fascinating ritual last year. Naturally, I had some follow-up questions after having been home to try to understand my materials and present them to a couple of different audiences. 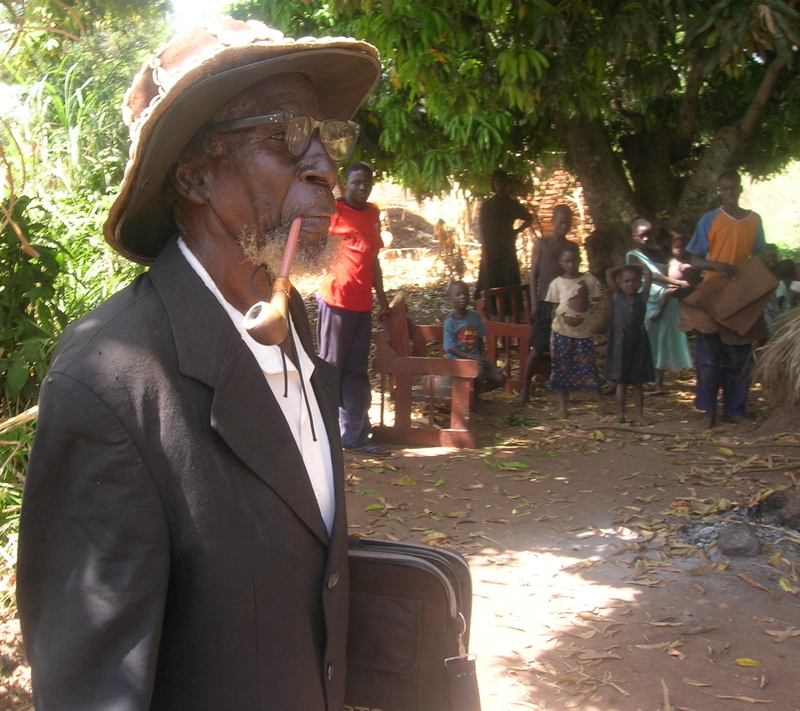 Mzee Kyambu invited me to take a seat next to him in the small shade of his eissabo (shrine). There he and his son, Andrew, gave me a ninety minute interview of extraordinary value. Two days later, they followed it up with another, shorter session. I’ve been so grateful to meet with hospitable kindness in Busoga, and those who have shown it to me have become truly valuable teachers. This latest body of work helps me to clarify some lingering questions and more effectively compare Soga ritual with what I’m seeing in Buganda. Now it’s about continued access to really solid language experts who can help me analyze and interpret these materials! Thanks for sharing a little bit of a glimpse into your Busoga work. It’s neat to see pictures of Kabindi and Kyambu again.